Over my years of foraging, I've come to recognize wild plums (Prunus americana var. ignota) as the iconic fruit of this region, where the plains push up against the Rocky Mountains. In the springtime, the air is heavy with the scent of wild plum blossoms. As summer progresses, the fruit develops from looking like a green olive, to blushing with astonishing sunset hues of pink, lavender, burgundy, and peach. Once you know how to spot a wild plum tree, you realize that the entire region is lined with them. Wild plums soldier bike paths, grow at the edges of farms and in fields, and make frequent appearance next to roads. The fact that wild plums are abundant in the ditches where I forage has led me to give them the affectionate nickname, ditch plums. Wild plum trees grow squat and shrubby, ranging from 5 to 15' in height, and tend to grow in clusters. Plum leaves are elliptic, serrated, and are generally from 2-4" long. The strongly-scented white blossoms of wild plum in the springtime are quickly replaced by round fruit that grows to be about 1" in diameter. Wild plums have a pit in the center that looks exactly like the pit you'd recognize in a commercial plum. Wild plums aren't ripe until they will drop from the tree with the barest touch. 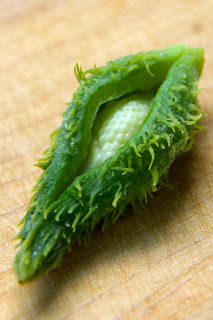 If you harvest them before this time, the skins will be quite bitter (but they usually ripen well if you leaves them in a single layer in a cool, dry place). I prefer to wait until the plums actually fall from the tree, and just scoop them up from the ground. If you've got a wild plum tree on a flat surface, it also works well to place a sheet or tarp under the branches, then shake it vigorously and collect the plums. 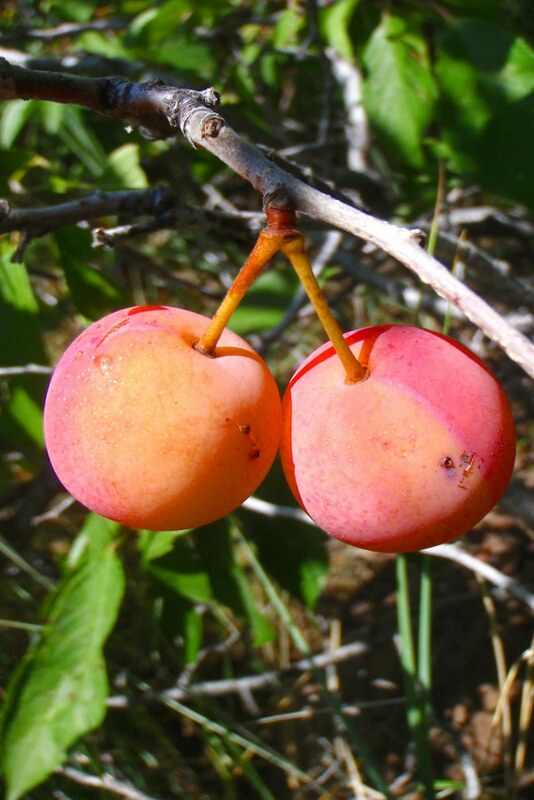 Wild plums are a deliciously complex fruit. 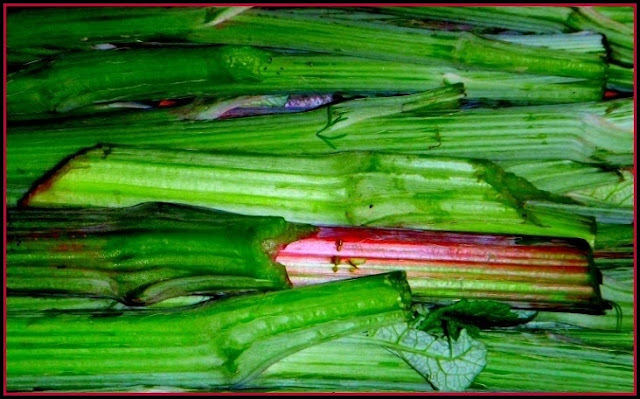 They are bright and tart just under the skin, with sweet floral fruit next to the pit. They take well to baked dishes, jams, and also to a surprising number of savory dishes. Wild plums are my favorite fruit for making ketchup. Using plums to make ketchup may sound a bit odd, but they are a fruit, as are tomatoes. If you don't have wild plums, you can substitute commercial plums, or any other stone fruit you please. 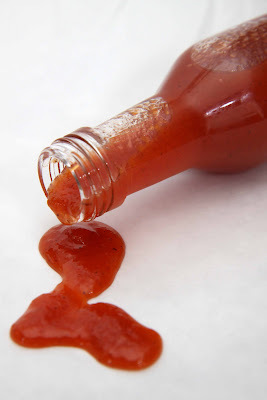 Peaches and nectarines also make lovely ketchup. Before cooking this recipe, make certain that your wild plums are completely ripe. The skin of unripe wild plums will add a bitterness to recipes that can't be corrected. There are several ways to make plum puree. Because wild plums are small, it isn't practical to scald them to remove the skin, as you'd do with commercial-sized stone fruit. Instead, I've come to use this method. To make plum puree, start by bringing a large pot of water to a rolling boil. In batches, place 2-3 c. of wild plums into the boiling water, let them cook for approximately 2 minutes, then fish them out with a strainer. You want them to be in the boiling water long enough to cook, but not long enough for the skins to burst. Once all of the plums are cooked, pass them through a food mill. This will leave you with a gorgeous pink puree, free of skins and pits. Feel free to vary the amount of vinegar, sweetener, and spices in this plum ketchup recipe to suit your tastes. Just keep tasting it until it hits the right ketchup-y notes for your palate. Wild plum ketchup can be used in all the places you enjoy tomato ketchup, from burgers to fries to meatloaf. Try plum ketchup with roasts and game meat. Or try using plum ketchup as barbecue sauce. 1. In a heavy-bottomed pan, combine all of the ingredients, and bring the mixture to a low simmer. 2. Let the plum ketchup cook until it thickens to a jam-like consistency. 3. Cool to room temperature. Store the plum ketchup in the refrigerator. This is my entry into the Hearth and Soul hop and Real Food Wednesday this week. Click the links and delight in all the real food recipes. Oh, what a great find! I would love to give this a try! I can think of tons of ways to eat it - straight up would be my favorite I think! A fabulous Hearth and Soul Hop addition! Foraging is always like that, sometimes we don't even know we are foraging, until we need a bucket to put it in! This looks so delicious. I will need to get some plums at the market, but this will make a lovely Christmas gift (and some for me!) thanks. This looks gorgeous...Iove the color of the ketchup so much and I know foraging is always fun!. Wild plum ketchup? I would like to try that. Mmmm, sounds great. I love new twists on old favourites! home made plum sauce! I made jelly with the wild plum this year but might try a batch of this next season. It has all the spices I love! We make wild plum jelly in the summer and I think we would just love your wild plum ketchup. I am putting this one on my list for next year. I love the sound of this. Being both sweet and spiced it would be good with so many things! This sounds wonderful! We used to grow plums when I was a child and we ate plums just about every way you can imagine, but I don't think we ever made plum catsup. I think I have been missing out! thanks for sharing! This looks great, and there's a chance I'll be getting my hands on some game meat... I might need to stop by the grocery for some plums. I've never thought to make plum ketchup before. I didn't even know such a thing existed, but it sounds so good. I'd love to use it on top of my chicken sandwiches. Wild plum ketchup sounds awesome - and what a beautiful colour. I'm not much of a fan of regular ketchup, but I bet I would love this as a substitute. Thanks for the inspiration. I get so tired of regular ketchup that I haven't eaten it in forever..... I think you may have awakened my interest!! Thanks for a GREAT post to the hop this week!!!!! Wow, what an original sounding recipe! Thx for sharing!! Wild plums will be a problem for me but you have got me thinking. Maybe normal plums or even some other fruit will do as a substitute. I've never thought of making ketchup from anything but tomatoes! This wild plum ketchup looks amazing. I don't know where any wild plums grow, but I'm wondering now what else I could make into ketchup! Thanks! Oh, I can already taste it on game! What a deliciously unique idea, thanks. What a fabulous idea! I'm going to have to add plums to my orchard now. Christy - I didn't even think about using it as a substitute for plum sauce in asian cookery. What a great idea! This would be a big hit in my family. We live to much a box these days and dare not to try something original. We can't be afraid to stand out, Yeshua did. Thank you for sharing! Hmmm. I thought I was done, but I want to make that, darn it. Never thought of making of plum based ketchup before but it sounds like it would be really good with lots of things. Great idea about canning the sauce instead of making jam with your fruit. I clicked through to this blog because of the picture. So glad I did. What a great site. I miss all of the spices and flavor in my mom's ketcheup. This sounds so good. I bet it is amazing on a burger. Thank you for that. I am allergic to tomatoes and had some plums simmering on the stove. I thought, wow, this looks like ketchup. I wonder if there is such a thing as plum ketchup for someone like me who is allergic. So I googled and you came up. This is great, I will make it right now, can't wait for my eggs and fries tomorrow morning to try it. Very creative. All sorts of fruit work well as ketchup. I happen to be especially fond of plums because of the tartness they add. Play around with different fruit until you find the one you like best. Wild plum ketchup, so beautiful! I might have to try this with our beach plums. I just made a version of this with plums from our yard! So good! I kept it raw, just blending it all together and adding in a little dried onion (instead of fresh) and garlic. SO good! Thanks so much for posting! I have a totally allergy to tomatoes, so plum ketchup will be a go for me in the future! Huh, there's a tree down the road whose fruit I didn't care for because it tasted too catchupy.